Usain Bolt’s Coach Speaketh in Parables – Knows He Not What the Olympics Embodies? Usain Bolt in London (Phil McElhinney photo). A schoolmate of mine whom I had not heard from in ages recently resurfaced. He was a “track star” at the old school we attended in Kingston. He wanted to know what I felt about Usain Bolt’s 9.85 secs in the Jamaican national athletics championships that will help select the team for the Olympics in China. “I think we can run 1 – 2 in the Olympics,” said my friend. I agreed immediately. Why shouldn’t Jamaica take the first two spots in the 100 metre sprint in Beijing with Asafa Powell and Bolt, the two fastest men in the world today? The immediate answer seems to rest with the individual coaches. Bolt’s coach Glen Mills has been non-committal about the athlete’s participation in the 100 at the Olympics. “We will not decide until August, when we have to let the Jamaica Amateur Athletic Association know,” Mills said. There seems to be a little bit of selfishness in there. Mills appears to believe that his charge is guaranteed a medal in what before last month, when he set the world record 9.72 secs for the 100, was his pet distance. If Beijing is not the goal, why put Bolt in the trials for the 100, why not allow some other eager sprinter a chance if it’s a matter of personal liking rather than the national Olympics treasure chest? 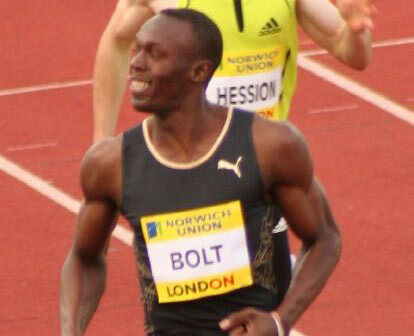 But that did not seem to be Bolt’s own feeling after his record breaking run in New York. Donald Quarrie, Jamaica’s most decorated sprinter seems confident in Bolt’s chances. “I think he is ready for it. His times have proven that he is capable of running fast, he is capable of doing the rounds and I am sure his preparation will get him into a position where he will perform at the highest level,” Quarrie told reporters in Kingston. Tyson Gay broke the United States record in the men’s 100 metres clocking 9.77 seconds at the US trials while Bolt and company were putting on their show in Kingston. Mr Mills may be playing some head games, trying to throw potential competitors off the trail for the games. But that’s unnecessary. These are the Olympics. While people do gain individual glory, as well they should, it is also the opportunity to make your country the best. The Quarries and the Merlene Otteys never had a need to play head games. They just wanted to get on the track and run to the tape before the rest of the pack and they fly the black, green and gold produly from the podium. And Merlene at 50 trying to qualify for Croatia or some obscure country only shows the never say die attitude that the Olympics spirit embodies. And that schoolmate of mine, our old school motto said “the brave may fall but never yield”.